It’s a seemingly simple question, but the answers can be anything but. I answer differently depending on who’s asking and why. Where we’re from geographically is one thing. Where we’re from is entirely different. I’m currently in the first month of my three-month yoga teacher training program, otherwise known as the Drink-From-The-Fire-Hose stage. I’m learning more – and more quickly – than I have in a very long time, and one of the things that I’ve learned is that, unsurprisingly, the way we use the word “karma” in mainstream language to mean “you’ll get what’s coming to you” is deeply inaccurate and ahistorical. There’s a lot of different ways to talk about karma and differently interpretations of what it actually means, but one of the ones we talked about last week that I hadn’t heard about before is the idea that karma is the lessons you learn in life from the things you don’t choose. And according to this school of thought, your family is your greatest karma – and therefore your greatest teacher. “Where you’re from” is your greatest teacher. I don’t know about you and your relationship with your family, but that idea makes me nervous. It can be incredibly painful to talk or write about where we’re from – about the unhealthy and negative and even abusive situations from our past (whether distant or not-so-distant) that created us as we are today. My biggest question for karma in that case is: What in the hell are you trying to teach me?! I don’t have the answers. I guess that’s sort of the point. What I do know is this. I’ll be the first to admit I like to wallow in my pain for a while as much as the next person. Licking your wounds is a very human thing to do. But after the wallowing and the writhing and the feeling-sorry-for-myself is over, for my own mental health I have to start creating something out of the ashes. How long that takes and what I create varies from situation to situation. But to me, creating something meaningful out of even the most painful situations in my life is the greatest act of redemption available to me. Notice I say “meaningful” and not “beautiful.” It doesn’t have to be beautiful. Our privilege often insulates us from having to experience the full force of pain in a given situation, and my feeling is that we tend to be a bit too concerned about getting around to that silver lining perspective and rustling up some happy emotions to make the discomfort and tension we feel dissipate. This happens when people say things like, “It’s okay to be angry, as long as you don’t stay there.” Stay where? Angry? I’m sorry, but I will always be angry until the world stops being unjust. “Angry” is a perfectly appropriate place to be, which is why I say that the art we create out of pain does not have to be beautiful. It does not have to be happy, and it does not have to make others feel comforted. It doesn’t even have to make you feel comforted. But it should be truthful, and it should mean something. What it means is up to you. We tackle this question in the Beginner’s Spoken Word Workshop that I teach, using a poetry exercise that prompts us to think of different ways to answer the question. It can be really difficult to go through for some people, including myself, because it means accessing the part of your brain that stores memories of a different time, when you were a different person, and your relationship to those around you was different as a result. But it’s also a very rewarding exercise, because coming to terms with those things is the beginning of the process of sweeping up the ashes and starting over. I’m teaching this workshop online TOMORROW, Tuesday August 29, 2017, at 6:00 PM central time zone. If you want to join us, there’s still space! We’ll be hanging out for a couple hours, drinking wine, going through some writing exercises, and sharing our work, all from the comfort of our homes + probably wearing pajamas. 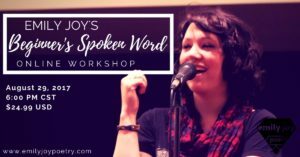 The cost of the workshop is $24.99, and also includes my customized PDF template of the main writing exercise and a free download code for my spoken word album All Prodigal Daughters & Sons. I would be honored out of my mind if you would be a part of this inaugural online experience. Click here to register or scroll to the bottom of the page. Either way, I encourage you to spend some time this week thinking and journaling through the question, “Where are you from?” You may be surprised what insights pop up and what inspires, sobers, reminds and comforts you. Where I’m from will never not be a complicated question to answer. But as my therapist once told me, cutting me off from a self-pitying rant: “You’re not where you come from anymore, Emily.” There’s a big wide world of new places to be from and new, healing experiences to have. Let’s get to it. 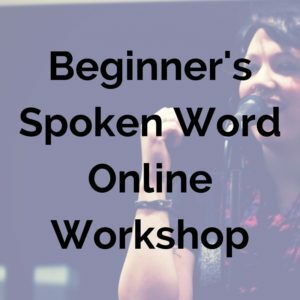 Online workshop to help you write your very first spoken word poem, or get some practice! Workshop takes place Saturday, March 24th, 2018 at 5:30 PM Central / 3:30 PM Pacific. Like what you read? Subscribe + get more!